Spring Mountain Vineyard is a privately-owned family estate devoted to Cabernet Sauvignon and the Bordeaux blending varieties. Of its 845 acre footprint, 225 acres are planted to vine and delineated into 135 individual hillside vineyard blocks. Each block has unique soil, exposure and microclimate characteristics. The great diversity of steep hillside plantings is the source of distinctive wines with concentrated flavors, soft tannins and supreme age-ability. 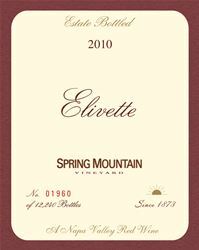 Spring Mountain Vineyard produces the following estate grown wines: Elivette- our signature Bordeaux-blend of Cabernet; Cabernet Sauvignon that captures the power of the mountain; Cabernet Franc; Petit Verdot; Pinot Noir; Chardonnay; Merlot; Syrah in a northern Rhone style; Viognier; and, Sauvignon Blanc that is barrel-fermented with sur-lie-batonnage. All wines from the Spring Mountain Vineyard are estate-grown and vinified to honor and reflect the unique terroir of Spring Mountain. The estate contains a number of historic structures including Villa Miravalle of 1885; the La Perla winery of 1873; the towered stone winery, Chateau Chevalier of 1891; and several caves and barns from the 19th century. We have several tasting areas. Each is described by the type of tasting appointment. Particulars: Full focus on our reserve wine with emphasis on their age-worthiness. Particulars: Full focus on our Cabernet Sauvignon with emphasis on their age-worthiness. Particulars: Focuses on our portfolio of wines and estate history. Wine Education: In depth, but tailored to the guests' level of interest and knowledge. To join the wine club, visit www.springmountainvineyard.com or call 707-967-4188. Spring Mountain Vineyard offers two ways for subscribers to enjoy our estate bottled wines, the Estate Series and the Collector Series. All Estate subscribers receive 2 bottles of current or limited release wine four times a year. Collector subscribers receive additional library vintages and large format bottles. All subscribers enjoy a discount on wine purchases, as well as exclusive estate privileges, winery events and private offers. We welcome our neighbors for complimentary introductory tastings for two people Tuesday through Thursday by appointment. Spring Mountain Vineyard is certified under the Napa Green Winery Program by the Napa County Department of Environmental Management (DEM) and the Association of Bay Area Government’s (ABAG) Green Business Program and completed all the regulatory components needed for environmental sustainability. These components included developing water and energy conservation methods, preventing pollution, and reducing solid waste. In addition to developing sustainable winery practices, this program is set to become the standard for the state of California. Spring Mountain Vineyard is certified under the Napa Green Certified Land Program. Spring Mountain Vineyard has created and implemented a customized farm plan with measured results that addressed all aspects of its property, vineyard land as well as non-farmed land, including practicing soil conservation, water conservation, stable drainage, riparian corridor enhancement, fisheries and wildlife habitat enhancement and long-term improvement and sustainability.